Stakeholders in Methyl Bromide Reduction (STIMBR) have recently begun a new research programme that is co-funded by the government's Primary Growth Partnership (PGP) scheme. The aim of the project is to develop new alternative options to the currently required methyl bromide-based phytosanitary treatments for export logs that will bring benefits to all stakeholders through addressing perceived public health risks, the environmental concerns, and the economic costs currently associated with methyl bromide. As part of this programme Scion is undertaking research to scope the feasibility of establishing a fumigant-free export pathway for logs in New Zealand. Dr Gordon Hosking (forest entomologist and architect of the recent STIMBR-PGP bid) is confident that an annual 'freedom from fumigation' period could be justified for up to 5 months when the risk of pest contamination is so low that it would be acceptable to trading partners. Scion is currently matching what we know about pest biology and ecology with potential points of insect contamination, e.g., logs on skid sites, at processing facilities or ports. The aim is to produce a spatial risk map that identifies and ranks the potential contamination risk at different times of the year. It will also highlight any deficiencies in our knowledge of pest ecology that must be addressed in the future. Once this is complete Scion will progress to a field-based research project to collect the base data required by MAF to negotiate a fumigant-free export pathway for logs with trading partners. To achieve a fumigant-free pathway will take time; trading partners will be wary of new initiatives and will require proof of the integrity of this new approach. However, similar pathways exist for many other products so the approach is not without precedent. Although this will take time the potential gains of a fumigant-free period are significant, both environmentally and economically. 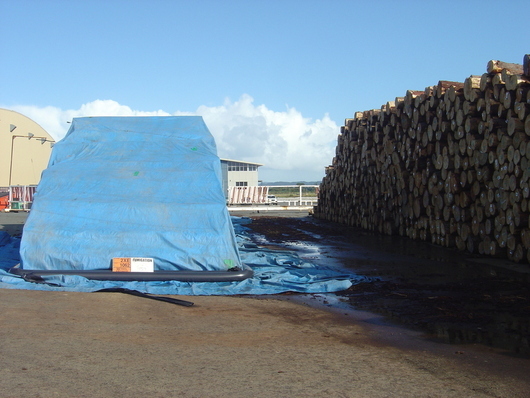 The clock is ticking on finding alternative phytosanitary approaches to the continued use of methyl bromide (MB) – photo shows logs being fumigated with MB, under a tarpaulin, for a deck cargo soon to be loaded for export to China.